With its new safety center, Volkswagen is bringing together its vehicle safety expertise at a single location. Blending into the existing architecture, a new three-story building with approximately 8,000 square meters of floor space was constructed at the headquarters in Wolfsburg. The centerpiece is a new state-of-the-art crash sled facility which for the first time can simulate lateral and rotational vehicle body movements both horizontally and vertically. "This state-of-the-art sled system allows us to reproduce the dynamic movements of a crash as well as simulate so-called 'prebraking' scenarios", says Dr. Gunnar Koether, Head of Vehicle Safety at Volkswagen. This is possible due to a highly sophisticated and precisely controllable hydraulic system on the sled, which can simulate both forward 'pitching' as well as lateral 'yawing' of the test vehicle immediately prior to impact. "In doing so", continues Koether, "we can accurately demonstrate the operation of modern active safety systems such as emergency braking in our sled tests." In such a scenario, the test vehicle is accelerated to 80 km/h and then braked shortly before impact. This type of pre-braking corresponds to a real-world accident scenario. "In this way, Volkswagen is setting new standards in accident research. In the new safety center, we are bringing together all of our safety-related activities under a single roof. That not only allows us to make use of new testing technologies but also it affords us shorter distances and additional synergy effects", says Head of Technical Development Services Kai Schweingruber. At the new sled facility, vehicle tests at speeds of up to 100 km/h with total weights of up to three tons are possible. The underfloor cable-rail system in the floor of the hall is over 140 meters in length. Thanks to a new pallet change system, the next test can be prepared as the current test is being conducted, which increases facility efficiency and throughput. 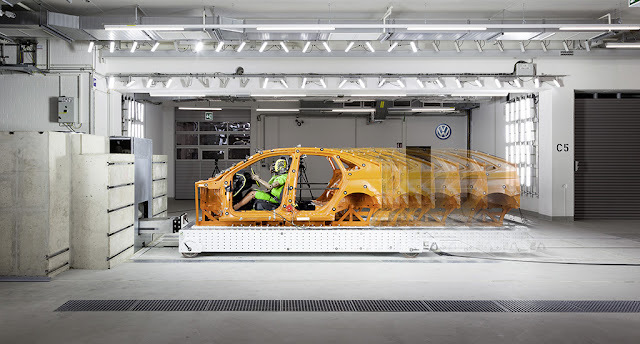 Around 800 sled tests are conducted each year by Volkswagen technical development. In addition to the new sled system, there are also multiple test benches located on the ground floor of the hall. On the first floor, the crash test vehicles are first prepared for and later thoroughly analyzed after the test. In the second floor, there are the workstations for the development team. The new high-tech sled was built directly adjacent to the second crash test facility, which entered operation in 1988. Both facilities are served by the same control room.